Daniela Ferraro can't touch people without hurting them. So when she wakes up in the Dark Caster's cell next to the one man guaranteed to mess with her heart, she will risk anything to escape. David Wilkes has no idea why he's been abducted and thrown in a locked room with Dani, the woman who jilted him two years ago. But when the Dark Caster threatens David's four year old son, David will not stop until Ryan is safe and the evil necromancers tormenting him are destroyed. When Dani's powers are bound and her necromancer friends are out of commission, the only way to protect the people she cares about and keep the Chaos Gate firmly closed is to trust in David. But the closer Dani gets to David the more lethal her touch becomes for the only man she's ever loved. This can be read as a standalone, but some details will be missed. See my review of book one HERE. 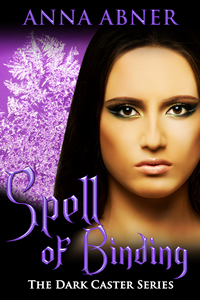 We briefly meet Dani when she helps our main characters in book one, Spell of Summoning. A preschool teacher and powerful witch, Dani has a fear that if she physically touches someone, she may accidentally hurt them with her powers. David on the other hand, is a perfectly normal human - with no special powers or abilities that he is aware of. So why did these crazy people kidnap him and Dani - and why do they think he's a necromancer? A lot of the history between Dani and David comes out in the beginning while they are locked in the basement - but the first part of the story moved a little slow for my taste. Once they escaped from the basement things got a lot better story-wise. David was forced to confront the fact that he may be more than he thinks he is - and he will have to deal with it and learn how to use it in order to save his son and Dani. David was a great character. I love when people don't blindly accept it when they discover the paranormal in books. David fought it tooth and nail and it made it that much easier to just fall into the story. His fear for the safely of his son drags him kicking and screaming into the paranormal world. Dani's fear seems a bit irrational at first, and I totally related to David's feelings towards her. As we learn more about her though, things are explained and her past has it's own share of hardships. Dani and David try to find a way to rediscover themselves and find romance in the middle of everything. They seem to be perfectly matched, but their pasts and their present are working both for them and against them.